Starting version 2.3, both databases became Maria DB by default (express installation). Hence the backup method has changed as well. - For BioStar 2.6, you must back up the encryption key. Refer to the backup instructions in the 2.6 database backup section below. You can use refer to the PDF attachment to back up your BioStar 2.0~2.2.2 database. For the T&A database, use the option to back up with the instructions shown in 2.3~ Database Backup below. Caution: You must stop your BioStar 2 server when backing up and restoring the database. 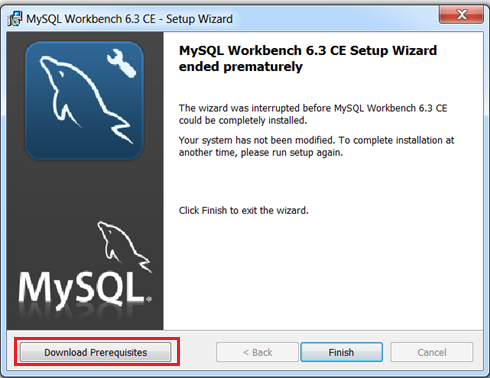 3.Click Download Now to download MySQL Workbench. 4.Click Looking for previous GA versions then select version 6.3.10 and click download. 5.Click No thanks, just start my download. 7.It will ask you to install the prerequisites. Click Download Prerequisites. 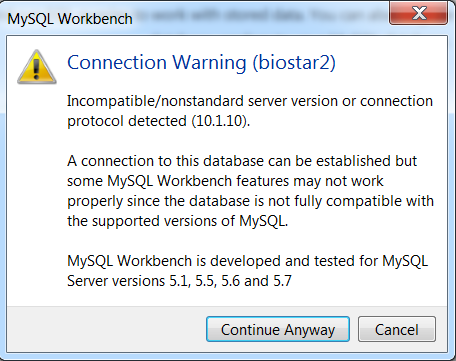 9.After installing all the prerequisites, run the MySQL Workbench installer again. 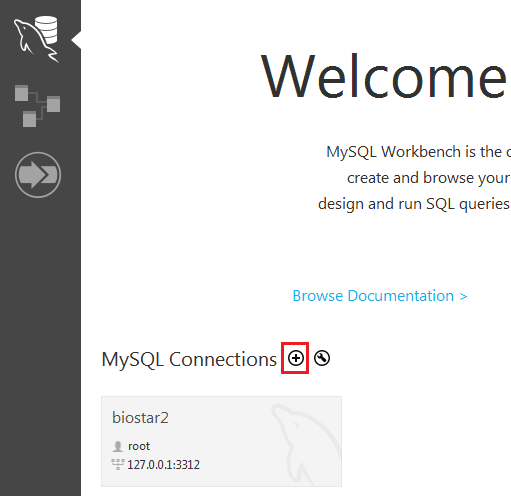 10.Launch MySQL Workbench with administrator privileges. 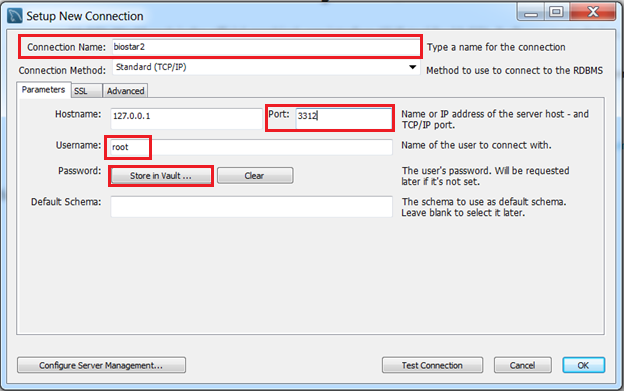 12.Set a name for Connection Name. 13.Set the Port to 3312. 14.Enter your database administrator id in Username. 15.Click Store in Vault … and enter password. 16.Click Test Connection and check that it is successful. 17.If you see a Connection Warning click Continue Anyway. 18.Click Ok to connect to the database. 19.Select Data Export on the Navigator. 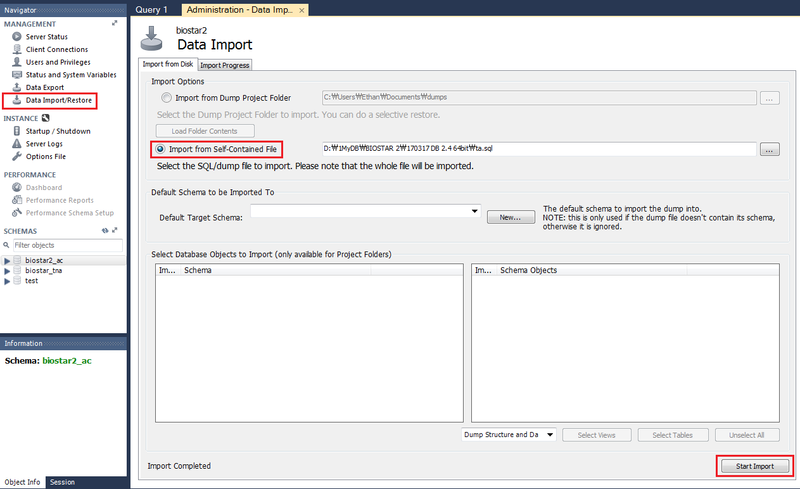 20.On Object Selection – Schema, select the database you want to back up. 21.On the right column Schema Objects, check that all tables are checked. 22.On Objects to Export check all three items. 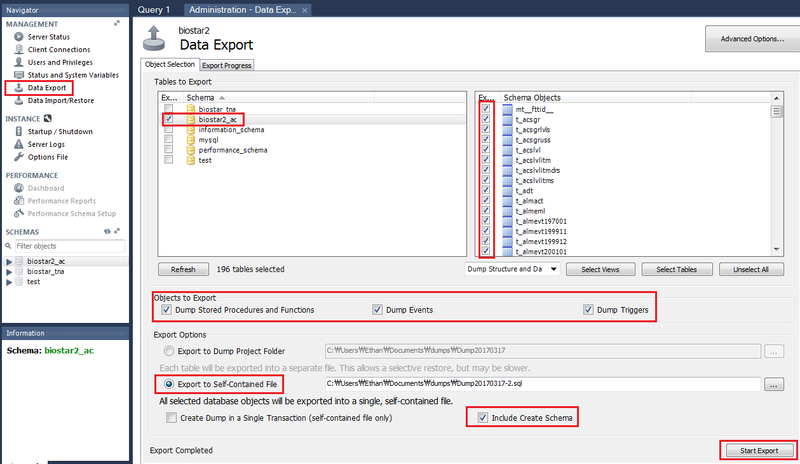 23.For Export Options select Export to Self-Contained File. Note: When providing the database for troubleshooting to the tech team, exclude the Include Create Schema checkbox. Restore the files in the path below if you are using the "Secure Communication with device" option.